The porcelain is naturalistically rendered in the style of a two-peaked scholar’s rock, accented with a pitted surface and covered all over with a warm greycoloured matte iron glaze enhanced by specks of black. 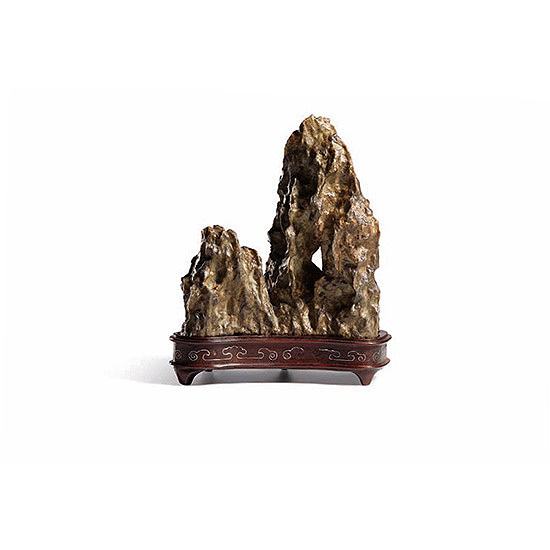 Hints of russet stemming from the oxidised body imitate inclusions characteristic of a Ying or Lingbi scholar’s rock. 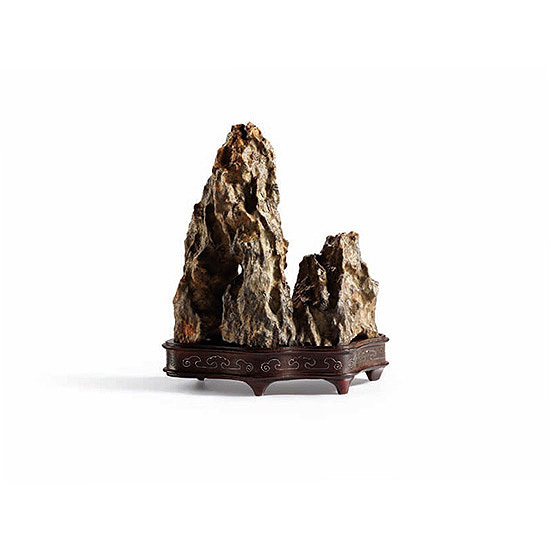 The rock rests on a silver inlaid wooden base with a banded cloud decoration. Tang Ying 唐英 (1682-1756) was a Manchu bannerman, official and artist and was the most celebrated Superintendent of the Jingdezhen Imperial Kilns. A similar example of a porcelain rock is published in The Complete Collection of Treasures of the Palace Museum: Small Refined Articles of the Study 故宮博物院藏 文物珍品大系：文玩, 2009, p. 124, Catalogue No. 94.